12/11/2009 - We left Alice Springs and flew to Sydney, the flight was only 3 hours so went quite quickly but with the time difference we didnt get to our hostel called Kangaroo Backpackers until 6:30pm. When we got to the hostel we were shown around by two young english lads who run the hostel. Our first impressions of the hostel were good, it looked really nice and there were lots of young people, most of them english! We put our bags down in the room and then we were told that everyone was going out tonight for all you can eat and then to a few bars so we decided to go along and meet everyone but we only had 40 minutes to get ready!! We managed it though. We got to the restaurant and started talking to everyone and we met a guy from Croydon - he was a right geek! He reminded louisa of will out of the inbetweeners! The food was really nice and they had live bands playing on the stage right next to us which was cool. And apparently one of the girls was from Australia Idol. After dinenr we went upstairs to the club which was really good then we moved onto to another club which overlooked the habour and it had some wicked views. We didnt stay too late as we were knackered from travelling around all day, so went off to bed. Louisa woke up early this morning to skype her friends back home. Then got back into to bed and we finally got up just before lunch. We got up, grab a map of the city then went out to explore. We found the main road that went from the habour to Surrey Hills, which was the area we were staying in. When we were in the city the weather was getting a bit cloudy so we found a cinema and went in and watched 2012 which was really good - Louisa cried!! 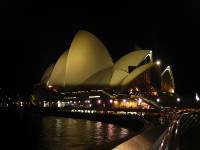 After the film we continued onto the habour and found the Sydney habour bridge and Opera House, we took alot of photos. In the morning we did a few bits that we needed to do like washing and sorting things out for our trip. Some guys from the hostel decided to go jet boating in the habour and invited us along with them. We all got a bus down to the habour for the jet boating. We both sat on the back row of the boat. The jet boat was awesome, we got some really good views of the habour, we wished we could have taken our camera on there but we got absolutely soaked from head to toe. After we went to a pub in the habour and had a few drinks. We stayed in in the evening and watched dvds with everyone, it was a nice chilled one. We decided to exlpore some more of the city today and first headed towards darling habour. We stumbled across a little shopping mall on the way there and it had lots of shops with sales on and we both bought ourselves some clothes :) Darling Habour was really nice, it had lots of water features and foutains that we jumped in. 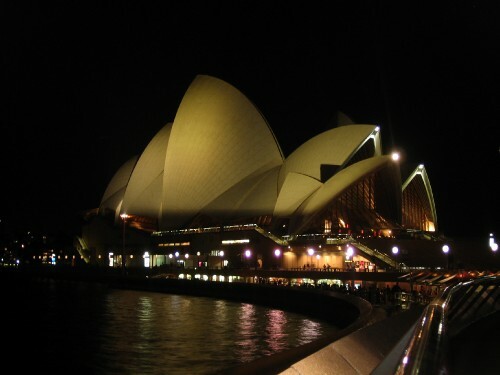 We then walked through the city to sydney habour and walked along the sydney habour bridge. Tom was going to walk over the top but it was really expensive so decided to save his pennys. We walked back to the hostel to see some more of the city, by the time we got back to the hostel we had been walking for 6 hours and were both totally shattered but it was a really good day. We had planned to go to bondi beach this morning but when we got up a few guys said they were going to another beach called Coogee beach so we went with them instead. It was a really nice looking beach but it was really busy. A few others came a bit later to met us. We all went in the sea, the waves were absolutely massive and we breaking right on the shore. We both got slammed into the floor a few times but it was really good fun. Louisa managed to get smashed by a wave and when she stood up she had lost her bikini top - oops!! We got up and went to the habour to get the ferry across to Manly as louisa had heard that it was meant to be really nice over there. It was a massive ferry and we got some good photos of the habour and the opera house. Manly was a nice little town which had a good selection of shops. We walked through the main street and sat on the beach and had lunch watching the surfers. On the way back tom bought himself a hat from Billabong. On the ferry on the way back the sea was really choppy and we were sitting right at the front. A massive wave hit and went over tom who was looking over the front and totally covered louisa - it was hilarious! After that we decided to sit inside for the rest of the journey! We got back to the hostel and got ready to go out with everyone from the hostel for another night of partying. We headed out to a place called the Gaff which reminded us of walkabout back home. We didnt stay that long then went to a new club called World Bar. It was really cool and we were drinking drinks out of teapots. 18/11/2009 - Day 7 It was our last day in Sydney so decided to go to Bondi Beach. We got a bus to bondi junction then had to get another bus to the beach, and it was packed. The beach was really nice and much bigger than coogee. There were loads of people surfing. We chilled out of the beach for a few hours then went to bondi junction and had a look round all the shops. We went back to the hostel and started packing ready to leave, then watched some more movies at the hostel.